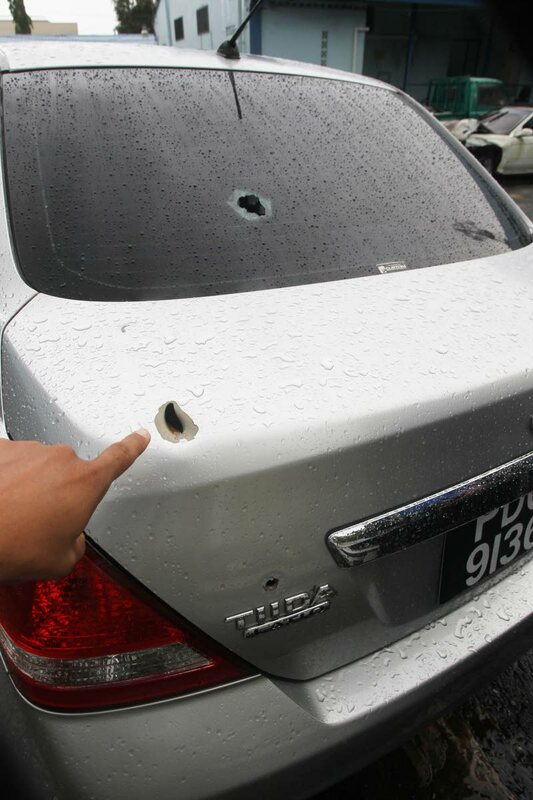 The bullet-riddled car driven by Mariana Moonisar, 28 who was gunned down while making her way home along Esperanza Road, Couva. GRIEVING father Roopchan “Chippy” Moonisar, 57, may have survived Friday’s shooting which claimed the life of his only daughter, but the emotional pain is worse than the physical one, a family friend said, yesterday. Moonisar underwent surgery at the San Fernando General Hospital (SFGH) to remove a bullet from his left cheek. He was discharged from hospital on Saturday. Moonisar and his daughter, Mariana, 28, a Parliament employee, were shot while returning to their George Street, Esperanza Village, Couva, home on Friday. Mariana was shot in the head, while her father was shot in the face. “Chippy keeps saying that he does not know if both of them were really the intended target. Obviously, he is fearful. He does not know if the killer would return,” said a friend of the family. Moonisar, a labourer at the Couva/Talparo/Tabaquite Regional Corporation, was the front-seat passenger in the Nissan Tiida car which he daughter was driving when the attack took place at about 5.30 pm on Friday. He was taken to hospital by a villager. “He did not even know he got shot at the time. When they arrived at the Couva hospital, staff initially thought the blood on his face was that of his daughter. He was so focused on her, her blood was on his clothes,” said the family friend. The father and daughter had a routine everyday. She would drive to the Couva Main Road on mornings and leave him with the car. She would then travel to Port of Spain where she worked as an administrative clerk at the Parliament. On evenings, Moonisar would meet his daughter in Couva and she would drive them home. Yesterday, police from Homicide Bureau Region III took statements from Moonisar. When Newsday visited the family’s home yesterday, he decline to speak about the incident. Police are yet to establish a motive for the killing and no one has been arrested. An autopsy is expected to be done this morning at the Forensic Sciences Centre at St James. Reply to "Grieving father discharged from hospital"